The Scrolls of Auschwitz comprise a variety of documents written by members of the Sonderkommando, or Special Squad, a group of predominantly Jewish prisoners who were forced to work in the crematoria at Auschwitz-Birkenau. (Son of Saul, which has just been nominated for an Academy Award for Best Foreign Language Film, was inspired by the Scrolls.) These writings were buried in the grounds of the crematoria in 1944. Between 1945 and 1980, eight caches of documents by five known authors were discovered, mostly by chance; few who knew their whereabouts had survived. As our recently published book, Matters of Testimony: Interpreting the Scrolls of Auschwitz, shows, the documents buried at Auschwitz provide important new insights into the Sonderkommando and into Holocaust testimony in general. The stories of the Sonderkommando from survivors of Auschwitz are mostly horrified and uncomprehending reactions to their abject status. They were often described as drunken brutes, who had betrayed their fellow Jews for the chance to live a few more months. More sympathetic writers still presented them as traumatized and devoid of emotion, and even survivors of the Special Squad often talked of only being able to endure their lot by giving up any inner life. The Scrolls of Auschwitz offer us the chance to hear the Sonderkommando’s own voices from what they themselves described as the heart of hell. Far from being the automata of legend, we can see them as feeling, thinking people. The Holocaust is almost routinely now described as unrepresentable, with attempts to represent it still denigrated as betrayals of the victims’ experience. The Scrolls show us that some of these victims made every effort to communicate what they were witnessing as they were living through it. The following examples of the documents give some idea of the range of writings the Sonderkommando produced. 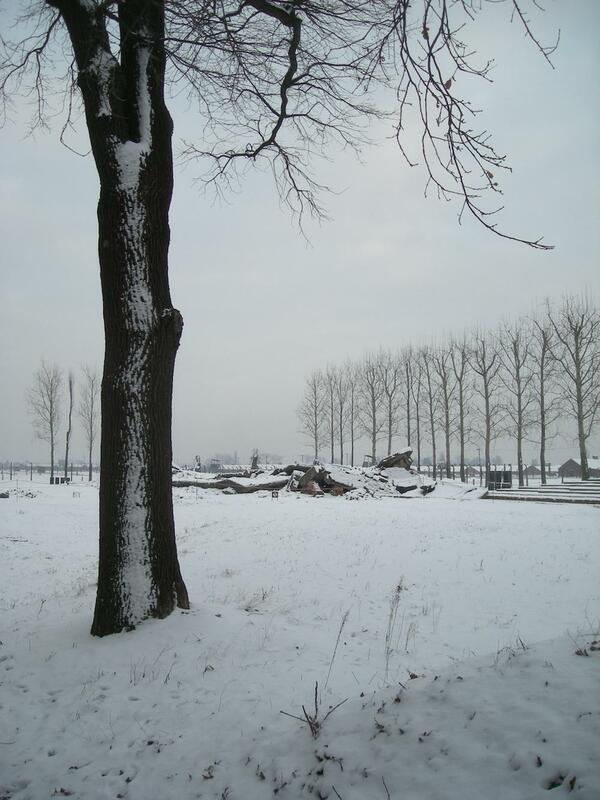 The grounds of Crematorium III, at the back of the Birkenau camp. Almost all of the Scrolls were discovered buried here. Where there are precise records of their location, they are all to the left of the ruins in the picture. The SS blew the crematoria buildings up before they evacuated the camp in January 1945. Penciled list in Polish. The list records the numbers of people killed in the crematoria in the month of October 1944. The list records: the date; how many people; whether they were men (“m.”), women (“kob.”) or children ("dzieci”); the place from which they came, and the crematorium in which they were killed. The Sonderkommando used a different numbering system from the one now used by the Auschwitz museum: “Kr. 1” is now called Crematorium II, and so on. Crematorium IV (Kr. 3 in the list’s system) is not mentioned as it was burned during the revolt of October 7, 1944. The shooting of 460 members of the Sonderkommando after the revolt is recorded on the right-hand side. Detail of a page from The Deportation, written in Yiddish by Leyb Langfus, the dayan (religious judge) of Maków Mazowiecki, a small town north of Warsaw. This text, filling most of a notebook, tells the story of the deportation of Jews from the ghetto of Maków to Auschwitz in December 1942. Most of them were gassed on arrival, but Langfus was drafted into the Sonderkommando. He almost certainly wrote the entirety of this account retrospectively, from within Birkenau. Langfus is utterly unsparing in his descriptions of the fear and suffering that they underwent, including the deaths of his wife and son. He also takes the time to organize his account into chapters. This simple act indicates that he thought about how to shape these overwhelming events and communicate them to a future readership. Water damage means that ink from the other side has bled through onto this page, but it is mostly legible. At the top of the page, he describes being overwhelmed with despair at being unable to protect his son. The title of Chapter 4, “False trickery,” can be made out in the middle of the image; the chapter explains how the Germans duped the Jews of Maków into believing that they were going to a work camp. 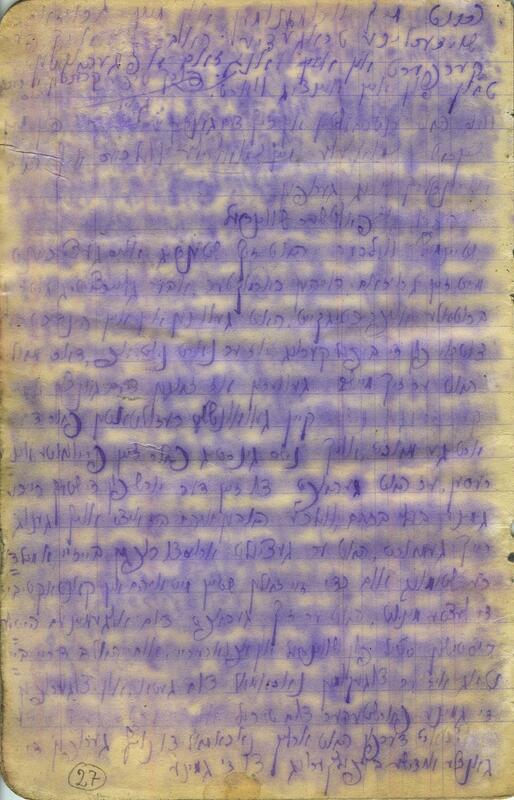 Page from Zalman Lewental’s manuscript, written in Yiddish. Lewental, from the town of Ciechanów to the northwest of Warsaw, was deported to Auschwitz in late 1942 and conscripted into the Sonderkommando in January 1943. He wrote the most detailed account of the Sonderkommando, including their plans for an uprising and how what actually happened fell far short of what had been planned. The manuscript was heavily damaged by water and the pages were separated and jumbled up in the process of attempting to preserve them. No record of their original order was kept. Our book offers a reconstruction of this order, based on a simple but overlooked (and not always easy to see) feature: Lewental numbered his pages. This order shows that he did not write his account chronologically but rather that after he had finished writing about the revolt he began to record other stories of how people had come to Auschwitz. This page (the earliest chronologically) discusses events in 1939. Part of what seems to be a title is readable at the top. The page number 93 is visible in the top left corner. This could suggest that the resistance among the Sonderkommando was what first inspired Lewental to write and that having done so he continued writing other stories as a way of continuing to resist. 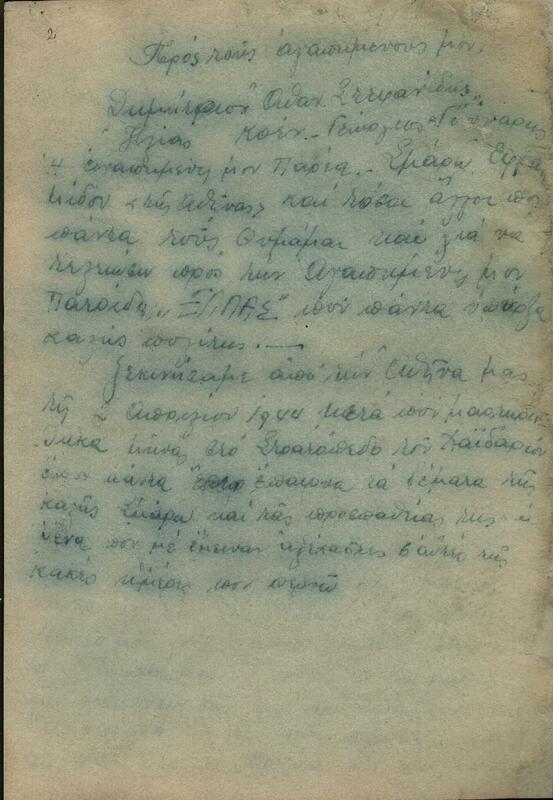 The second page of Marcel Nadjary’s manuscript, written in Greek. This was the last of the Sonderkommando manuscripts to be recovered, in 1980; of the other pages, some contain only scraps of phrases that can be deciphered, and others are entirely illegible. Nadjary, a Greek Jew from Salonica, took part in resistance to German occupation before being captured and transported to Auschwitz, arriving in April 1944. His text is very different from the manuscripts mentioned above. He writes a letter to named recipients left behind in Greece. He shows a fierce patriotism, exemplified by his writing “Greece” in capital letters. Unlike Langfus and Lewental, Polish Jews whose entire world had been destroyed, Nadjary shows some hope for Greece in the future, if not for his own survival. 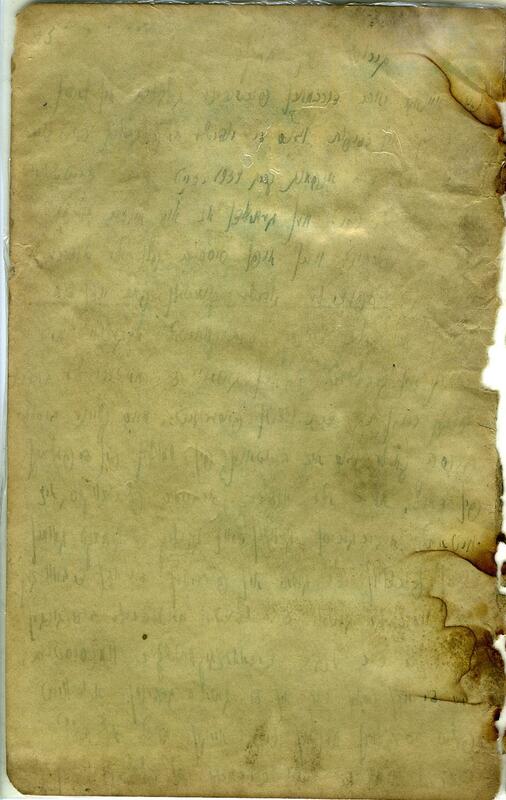 In fact, he was one of the rare survivors of the Sonderkommando, although he died before this letter was discovered. Even what little is decipherable of his text gives us an important sense of the variety of backgrounds of members of the Sonderkommando, who were drawn from Jews of many different nationalities.